Good Night Best Bangla SMS and Shayari Here is some good and the best Bangla SMS for your girlfriend and the boyfriend, Some are SMS is very good and some SMS are very interesting for you all guys. And this is the best sms portal in the world. thakur photosWhen you search gogle good night sms in bangla, you face as many website. But our website is the best for all sms. You just type google bar bengalishayari.com. before the selleping time e are all share friends good night sms by whatsapp, facebook, twitter etc. Aka aka bhase sottikarer bondhu hoye, mone khushi ashe, raat jaga kono pakhi jeno, ajana pother jatri somoy holo abar tobe, janai shubho raatri………. Bondhu tumi acho dure, Tabu o tumi acho maner madhye, Sara diner kelanti shese, Mane hay ami tomar i pashe, Swapne o abar asbe tumi ,Tomay janai shuvo ratri……. Asbo rater swapno hoye , thakbo ami pashe, chokh khultei chole jabo vorer alor deshe, diye jabo kichu shrity a jai SHUVO RATRE !! rater tara cheye dekho aka aka vashe, satti karer bondhu hole mane khushi ase, theko nago dure tumi, aso amar kache , dujon mile ghumoye pari swapner oi deshe,………….. GOOD NIGHT !! Surji mama asto gelo Pakhira sab basay alo, Tumi o akhon ghare aso Ratri dekho anek holo, Khawar shese ghumiye paro Kaj akhon tumi dure rakho ……….. Good night ! Maner majhe Kichhu dag Sara jibon theke jay…. Chaileo moche jay na ….. Bhola o ajay na …. GOOD NIGHT !! Anek bhirer majhe o aj amar, Baro aka ki lage Chokher ghumer majhe o manta rij i …Rat jage……… GOOD NIGHT !! Jete Jodi chao tumi Debo na ami badha ,Shudhu bolbo amar ai bhalobasa Mithye nay he radha………. Good night …………..
Jato din beche thakbo…….Ai vabe valo basbe to…..Naki rater tarar mato Sakal holei hariye jabe Dur akashe………..good night …………. Surjo dilo alor dhara , Akash dilo hajar tara , Sandha alo chader sathe , Mon miseche moner sathe , Niviye dilam alor bati , Abar janai shuvo ratri……… GOOD NIGHT !! Rater bela majh akashe Aka bose chad, Bolche jeno ratri khani, Katuk valo sabar…. SHUVO RATRI !! Amullo roton prem mullo deoya jay na. Premer premika chhara se kotha keu bojhe na..premer jala boro jala, jole readoyer agune… mete nato se jala, asuk jato falgun..
Kakhono bolna tumi happy jakhon , Tumi koste achho bolo na tumi valo, acho jakhon tumi bhalo nai ebong, kakhono bolona tumi eka. jatokhon ami tomar songe achhi. Meyeder mon jay na bojha..Boro –akha—baka. Kake kakhon apon kore, banay moner raja..
Tomar namer mala jopi. Ami prem jopi…Sargo such love hoy…Tomay jakhon seki…. Valo Jodi na basbe, Tobe keno dile asha. Betha bhora buke ar. Bolar moto nei bhasa…. Amar moto chhele tumi , Pabe na kothao,,,,Tumi je dropodi, Sobai ta jane..
Rat aro baki, Ache onek kotha…Jani na amonbhabe,,,Kobe hobe deka…..
Amon tumi korechho dhong, Jeno amay cheno na. Sedhe tomar kachhe, Seta tumi bhebo na. Katokhon amon bhabe, Khelbe tumi lukhchuri.. Asoona pase amar kachhe,, Soyna je ar deri..
Boyos to tomar kom holo na. Amar ja ache sob tomaroi.. 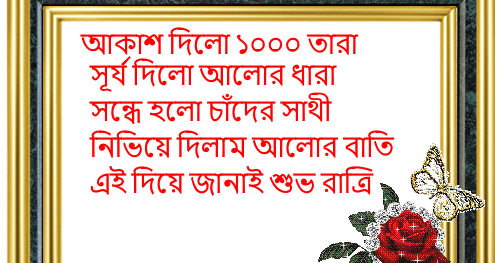 Thanks for read Good Night Best Bangla SMS artical. Wait and see all update.